Dr. Shapero has studied the area of nutrition quite extensively and continues to keep updated on the most up-to-date nutritional research available. He offers a wide variety of nutritional products for those who need that extra help now and then or for those who just want to do better than to “just get by in life.” Nutritional needs are as diverse as you are so the programs and recommendations which are made for you are based on what you need. As your needs change we are able to track those changes and modify the recommendations rapidly. The body's nutritional requirements vary directly with factors including one's age, activity level, fitness, environmental pollution, stress levels, and genetics. There are many ways for evaluation of one's nutritional needs, from simple cravings for specific foods to highly sensitive laboratory tests which reveal trace deficiencies in the blood, urine or other body fluids and by-products in the stool. A qualified Nutritionist or trained Chiropractor such as Dr. Shapero can help you determine whether food allergy tests are indicated, or if digestive remedies are called for. Nutritional requirements differ from person to person, depending upon whether the individual is ill or in good health. For example, a diet focused on maintenance of health will be very distinct from one intended to help heal an acute or chronic condition. To order supplements you must be registered with our office to register first, click First Time Registration, or click the vender of your choice below. For assistance contact our office. 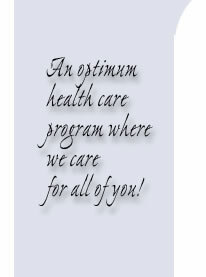 While we carry Metagenics, Standard Process, VRP products, neither Dr. Shapero nor any third party associated with, related to or linked to Premier Health Care's business or website (other than the official website of any and all products herein mentioned) is in any way affiliated with the above mentioned company. Standard Process, Metagenics and VRP expressly disclaims any responsibility for and makes no representations or warranties regarding any statement, information, materials, or content found on or included in Premier Health Care’s marketing materials, website, or any third party marketing materials or websites related to, associated with or linked to Dr. Shapero's business or website.